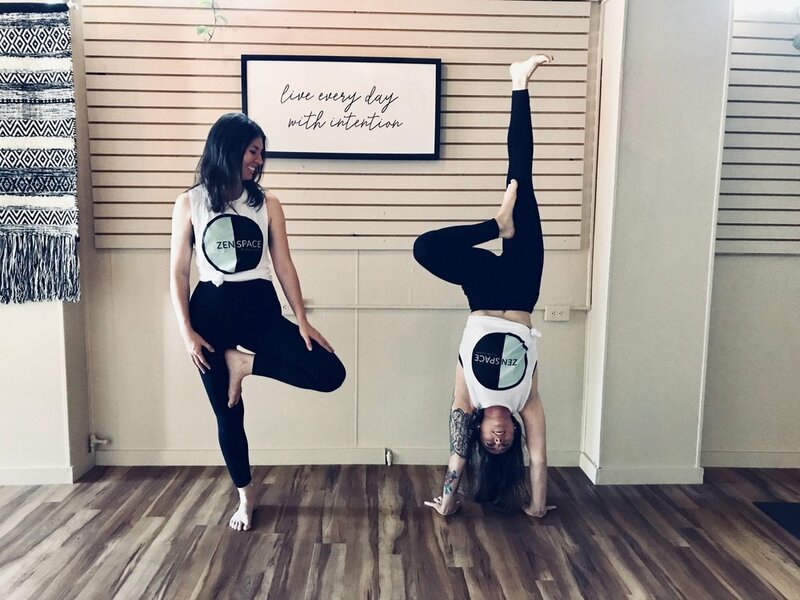 Zen Space, located at 16 S. Highland Avenue in Highland Square- is a new yoga and meditation studio brought to life by Yoga Squared. Why a new space? One of our main goals is to bring the practices of yoga and meditation to unexpected places. When we saw our community’s interest in meditation start to rise, we knew that we wanted to create a space right in the middle of the action where our friends and neighbors could stop and sit still. Where meditation feels inviting, not intimidating. Where different styles of yoga coexist with unique and special meditation classes designed to cultivate different experiences and energies. We have also noticed-as have you, if you’re a regular student at Yoga Squared-that our after-work crowd is strong! We have been brainstorming for a long time about how to create more space in our nightly rotation, so we knew that we wanted to provide options for yoga at Zen Space, as well. Bring on the Non-heated Power and Yin/Yang classes! Finding the space felt so easy. Of course, there was hard work to be done in order to create the feeling we were looking for: alive, peaceful...a diamond in the rough that is the heart of the Square. Our friends at Every Blooming Thing were there to listen and help us choose the plant life and decor that would give the space the liveliness and beauty that it needed. Our friends, family, and even our students jumped right in with ideas, support, and so, so much help. We are beyond excited to bring this new space to our neighborhood, but more than that...we’re thankful. We are thankful to our students for showing up day in and day out, willing to put in the work to make huge shifts. You have inspired us, and in turn, we want to provide more inspiration and more possibility to you. These practices may be ancient, but they are something that the modern city dweller wants and needs, too. Thank you for allowing us to fill a void in Highland Square-we are so happy to have been planted here. What is the ZS experience like? This 14-person studio is equipped with luxurious cushions and props, including the latest Manduka GRP mats, Samaya meditation cushions, and the high-quality blocks and straps you're accustomed to at YS! When you arrive for any ZEN meditation class, you'll find that all props are assembled for your use. In the neighborhood and jonesing for a 30-minute retreat? Just drop by- we have everything you need. Meditation attire is a little more flexible. On your way home from work with no time to change? Just stop in and sit down. There is a small changing area as well as a small restroom, but space is at a premium at ZS, so please pack lightly! We have small key/phone cubbies and purse/coat hooks, and our doors will always be locked during class. Coming by for yoga? You're welcome to bring your own mat, but we will always have a mat available for each student at ZS to use. All props are available at all times. We want you to feel comfortable and cared for at Zen Space. Where to park... ZS is located right in the Square, about a 1 minute walk from Yoga Squared. There is street parking on S. Highland in front of the building. If those spots are taken, you might need to park in another one of HSQ's parking lots or street spaces. $75/Month for access to both Highland Square Studios! This is a minimum of a 3 month commitment and after that you can request to cancel your membership with a 30-day written notice to be submitted through email or in person! Space in the Zen Space studio is limited, and as a result we will have a tighter cancellation policy than the liberal (lack of) policy at the YS Mothership. You must cancel your class or cushion within 2 hours of the class start time so that other students are able to book or you forfeit your class (if using a class pack) or suffer a $5 late cancel fee for unlimited members. Ahh! If you know us, you know we don't like to be strict, but we want you (and you, and you) to have sensible access to find your energy, breath, peace, and ZEN! We want you to be able to access this space when you need it the most, whether that's every day, once a week, or anything in between. Growing this woke community means we must work together!